June has passed quickly in our house! We were able to focus on the Armor of God for about 2 weeks and the boys really got into it. I loved having a plan and sticking with it. The boys knew we would be talking about the Armor of God each morning as they pulled their placemats out for breakfast. It was a great way for me to feed them truth before our day got started. What I really loved is that I could refer back to the Armor and it’s pieces throughout our day. I tried to catch them and ask them what part of the Armor they needed or could be using in their day, and for different activities or interactions with others. I felt less scattered, pulling from different lessons, and much more focused in on one concept. We pray you all enjoyed having a plan for June and look forward to July and a new focus! Well, it’s time to put away your Armor mats and pull out the Jesus Is mats! 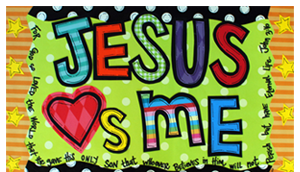 We love this mat because it is all about the names of Jesus and it appeals to all ages. While older kids can use and learn from all of the mats, this mat seems to really catch the eyes of our younger kids too. 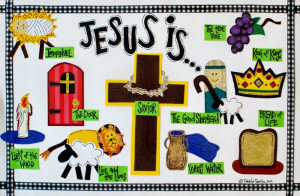 We have seen kids as young as 2 be able to tell the names of Jesus using the pictures of this mat. There is a lot of good information on the “Jesus Is” card, which defines each name/image of Jesus and gives a couple of questions to go along with each image/name. We would encourage you to take one name and focus on it for three days. There are 10 images/names, so that allows about 3 days per name for the month of July. If you have younger kids, focus on just getting them to learn the name and what it means. You can have them draw their own version of the name or act it out. 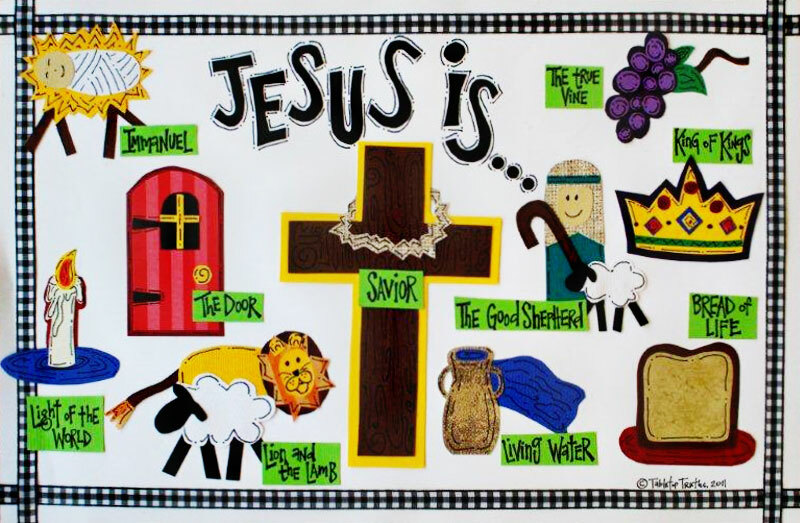 The awesome thing about these names of Jesus is that our kids see them in their everyday lives for the most part. You can look up pictures of lambs and lions, you can talk all about doors when running errands, you can make bread for the Bread of Life, you can read about shepherds and how difficult their jobs really were, you can make a crown for a king, you can eat a platter of grapes and examine how the grapes grow on the vine, you can light a candle in a dark closet and see what happen, you can let them play with water (that’s an easy one in the summer, huh?) to show the Living Water, you can spend time talking about what it means to save someone and what He saved us from. The possibilities are endless. Remember, the more repetition they have, the more God’s truth is planted in their hearts and minds. To reinforce the names, images, and meanings for Jesus, you can make a memory game. You can use the 10 images and do a memory match game for the little ones. For your older kids, put the 10 images on one card and the meanings on other cards, and have them match the image with the meaning. For your older kids, it would be fun to have them to a little extra digging in their Bibles and challenge them to find more names of Jesus. Maybe have another contest and reward the one who finds the most! And remember, just have fun with it! The more they see us having fun learning about God’s Word, the more they will want to too! It doesn’t have to be complicated, just consistent. By learning the names of Jesus more in depth, your kids will be learning about their Savior more, and what’s not to love about that! © TableTop Truths. All Rights Reserved. Web Design by Little Fish.